Be part of the largest worldwide tandem skydiving event ever! 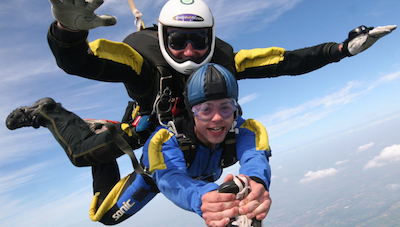 As one of the charities to benefit from the 2014 successful attempt to break the world record for the number of tandem skydives in a single day Worldwaterworks Ltd (Rotary Water-Survival Box) has been provisionally allocated 8 places for the 2015 attempt to raise the record from 281 (2014) to 333. The attempt is to take place on Saturday, 20 June, 2015 and individual nominations need to be registered by 31 January. The following information has been received from the organisers and individual Rotarians, members of their families, or friends, are invited to take part in this unique experience whilst raising sponsorship for our Rotary charity.